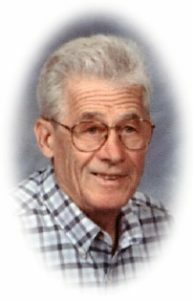 Ward J. Braby, age 88, of West Monroe Street, Port Washington, WI died unexpectedly Tuesday, August 15, 2017 at his home. He was born on May 3, 1929; son of Wilbert and Jessie Sanford Braby in Port Washington. A graduate of Port Washington High School-Class of 1947, Ward took a job at Simplicity Manufacturing Company in Port Washington soon thereafter. For over 47 years, Ward took great pride as an employee there until his retirement as a Assembly Lead Man. On May 4, 1957, Ward married Joan E. Bichler, also of Port Washington, at St. Mary’s Catholic Church in Port Washington. She preceded him in death on July 14, 2009. A faithful and strong family man, Ward always seemed to have an evening job. He had done janitorial work for the former Port Washington Savings and Loan, Thomas Jefferson Middle School and for Ozaukee County Administration/Courthouse and the current Justice Center for many years. Ward was a member of the International Association of Machinists and Aerospace Workers Local 1430 for many years. Some might remember him for his early hour swimming at Thomas Jefferson Middle School pool or his neighborhood walks with his canine pal Beatrice. He is survived by his daughters Jean (Mark) Jacoby of the Town of Erin and Joanne (Dave) Dahm of Belgium; eight grandchildren Lauren (Daniel) Rakowski, Alyssa (Shane) Alloway, Shannon (Joe Heisler) Jacoby, Christopher (Kaitlyn) Braby, Ryan (Cesie), Matthew (Bianca), Sarah and Danielle Dahm, great-grandchildren Tyler, Cole and Jaxen Rakowski and Raegan Dahm; brother-in-law Harlan Meins of Port Washington; nieces, nephews, other relatives and friends. Ward is preceded in death by his wife Joan, his sons James “Jim” and William “Bill” Braby, his sister Nancy Meins and his brothers Foster, Merle and Gordon Braby. A Mass of Christian Burial will be celebrated at 7PM, Wednesday, August 23, 2017 at St. John XXIII Parish-St. Peter of Alcantara Chapel, 1802 N. Wisconsin Street, Port Washington, WI. The Reverend Patrick Wendt will be the celebrant. Interment will take place at St. Mary’s Cemetery in Port Washington. Family will receive relatives and friends from 4-7PM Wednesday AT CHURCH prior to Mass. My prayers go out to you and your families. After being one of your brothers best friends for many years. I was always treated like a surrogate son by Ward and Joan. They all were amazing people and I would not trade those memories for anything. I truly believe knowing your family has made me a better man and person. I am really sad hearing about Ward. I worked with him for many years at the Justice Center. I always worked late, so always felt a little lonely there, and he was such a friendly, smiling face to greet me. We would chat a little about our lives, and then he would move on. Such a great man. I did the same with son Bill, who I didn’t know for a long time was Ward’s son. And George Pujanowski. Three great, wonderful, and kind men, all on the “other side” keeping heaven’s hallways tidied up. And another man whose name I can’t recall. I no longer work at the justice center so I don’t who is carrying on. I sure do miss him, and I will continue missing him. I’m sure you all are proud to call him Dad and Grandpa and Great Grandpa and Uncle. May memories of him comfort you all. God be with you. My prayers will be going out to him this evening. Uncle Wardy was a great man he will be missed but he is joining the growing list of saints (small s) and taking his place, my sympathy to his children here on earth! We are so sorry for your loss..Prayers and condolences sent to you and your family.